Ever heard of Lip Print Reading? It’s the newest form of palm reading / personality test. Put your lipstick on, press your lips to a piece of paper and get it read. Sobelle Favors was excited to be part of a lip reading hosted at Silverleaf Country Club in Scottsdale, Az. 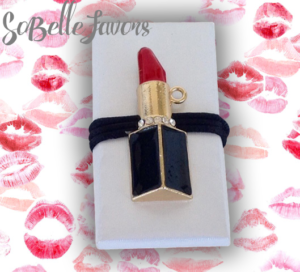 We created this fun lip stick themed favors that were perfect for the black, white and red event. The lipstick pieces were special ordered and worked perfectly on the white wrapped chocolate. At SoBelle Favors, we love doing special events like this one! The pieces are always unique and turn out perfectly. Matching a themed evening, like lipstick, gives us a chance to create something new and exciting and as always, make the guests happy.